Those with sharp enough eyes, who know where to look, should be able to see Comet Lulin in the sky even as I type this. It should be somewhere in the constellation Virgo, with a magnitude of about +6 (you may need binoculars if you’re a city dweller). It reaches its closest approach to Earth on Tuesday 24th, at about 0.41 AU away. Comets are fascinating things. Even more so when, like Lulin, it’s on its first visit to the inner solar system. Comets are, after all, full of ices. As it draws near to the Sun, all of those ices start to sublime into a huge extended atmosphere called a coma. This coma is huge, but not very dense. The end result is a tenuous glowing gas cloud that can easily be as big as Jupiter. The solar wind interacts with all of this, puffing it in the opposite direction to the Sun and causing the comet to sprout a (sometimes magnificent) tail. Lulin is also a striking shade of green. That comes from a couple of particular molecules that it’s particularly rich in. C2 (dicarbon) and CN (cyanogen). Probably C3 too — a molecule which was actually first discovered by looking at comets. In spectroscopy, the brightest C3 band is still commonly known as the “comet head” band. Other comets, like Halley, contain different ratios of these molecules because each pass near the Sun causes ices to ablate away or react together, chemically changing the comet. The result is that they glow in different colours. 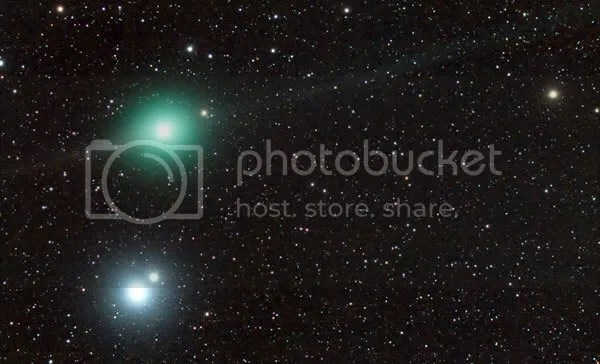 This image, incidentally, must’ve been taken around February 6th, because that double star in the background would be Zubenelgenubi (also known as Alpha Librae). Image beautifully photographed by Mike Broussard. Go and look at his other photographs. They’re rather lovely — especially all the comets! This entry was posted in astronomy, Imported from Livejournal and tagged astrochemistry, comets. Bookmark the permalink.